Dream Hostel Guesthouse is a beautiful, small, family-run hostel in a safe, local neighbourhood in the heart of Montego Bay. We provide a home away from home while you're staying with us. Our main aim is to make you feel at home and give you the best Jamaican experience while you're staying with us. We can organize all kind of tours for you, pick you up from the airport and provide a personal driver whenever you need one. Whatever you need, we we'll make it happen! Our place is very private but we always have an open ear for our guests. We like to interact and party with our guests if they wish to do so. 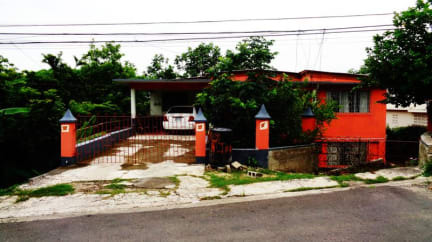 Our hostel is located in a residential neighbourhood in Montego Bay. The area is very safe yet local and gives you the change to get away from the hustel and bustle of the main tourist area. It takes a short 5 minutes ride by route taxi to get downtown. To the beaches and the hipstrip it takes about 10 minutes by route taxi and to the international airport about 15 minutes. In less than five minutes walking you can get to 24 hour food stalls, small supermarkets, an ATM and the hospital. Dream Hostel Guesthouse has 4 bedrooms, two bathrooms and a fully equipped kitchen for you to use. We provide towels and WiFi for free. In the living area there is a TV and a small library for you. In our backyard we've got a balcony where you can go to smoke and chill out. We usually host two people per room, but if needed we can provide additional beds for you. Check in from 13:00 to 23:00 . There is no official parking lot close by but it's safe to park your car on the road in front of the property. Since we respect all our guests it is not allowed to smoke inside of the hostel but we've got a balcony that you can use for smoking. We werden welkom geheten door de eigenaar maar daarmee was alles ook gezegd. De eigenaar niet meer gezien. De kamer is netjes maar alles is erg verouderd en ziet er daardoor vies uit. Er is geen AC aanwezig, enkel een ventilator. De kookplaat in de keuken zou moeten werken maar er was geen gas/aansluiting waardoor dit niet ging. De locatie lijkt in een veilige buurt te zijn maar nagenoeg alles moet vanaf hier met dr taxi, waardoor met name de ritjes 's avonds erg duur worden.